When I’m providing pastoral counseling for married couples, I generally spend some time talking about the “emotional bank account” that many have found helpful. The illustration is that every human heart is like a bank account. And as with every other bank account, it is better to make deposits than to make withdrawals. In fact, if you take out more than you put in, you bounce checks. When it comes to relationships, if you spend more time criticizing someone rather than giving them positive feedback or praise, you’ll essentially “bounce” the relationship. So we should do our best to offer way more positive “deposits” than make negative “withdrawals.” I’ve heard suggestions that there should be four positive praises for every negative criticism up to ten positive praises for every negative criticism. I’m not sure if there is a correct correlating number between the praise and the criticism. It would seem that since we seem to often exist in an environment that is far more critical than positive, perhaps we need a complete change of thinking. I really do think our culture tends to focus on the negative. In fact, sometimes it’s hard to not be more critical than positive and sometimes it’s been difficult to come up with positive ways of affirming people. 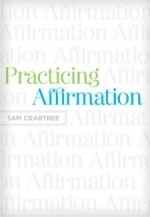 When I saw that Sam Crabtree, the executive pastor at Bethlehem Baptist Church, wrote a book called Practicing Affirmation, I knew I had to read it, and subsequently, review it. “To fail to commend the character of Christ in people is to fall into the same lackluster indifference of a person who never exclaims what a beautiful morning it is, thereby robbing the Creator of glory he deserves for making that sky, that volcano, that character.” (p. 24). This really hit me. But there’s more. The way that these characteristics are fleshed out and explained are extremely helpful and provide some great insight towards how you can be better at affirming people. One helpful section of the book was the last chapter, “100 Affirmation Ideas for Those Who Feel Stuck.” The list is so practical and helpful that I think Crossway should put out a one sheet on it. Yet I do have a criticism. Well, it’s more a concern. But how do you write a concern about a book on affirmation? I don’t know. But here goes: my concern is actually for the readers. If the readers don’t properly digest the first chapter which lays the foundation for Godly affirmation in a God-centered way, they could easily just create a “list morality.” So my criticism isn’t for the book, because I think Crabtree rightly addresses the concerns that could arise; rather, my concern is for you the reader to make sure that you understand the proper foundation for biblical affirmation. This book was so good that I actually plan on using it for future teaching in our church. I’m not sure if we’ll use it for a small group study or as some guidance for Sunday morning’s teachings. I just know that I was gently rebuked and greatly encouraged affirmed!